But we did visit two of the bakeries on Thursday afternoon, and showed remarkable restraint by only sampling a few things! First, we went to the Dovetail Bakery on NE Alberta St.. Very nice texture and flavor-- the cupcake wasn't overly-sweet or gobbed with icing, and the roll wasn't overly-gooey. I'd go back! Next we headed over to the Back to Eden Bakery Boutique, also on NE Alberta St. They sell other things besides goodies! But the goodies are what we came for! What to choose?? Pumpkin Whoopie Pies or little tarts? A savory quiche or empanada? What a place Portland is to be able to support so many vegan bakeries!! I am really impressed with that fact AND the quality. More tomorrow! It's been too long since I blogged! I've been in Portland, OR for 5 days, with 2 more days on either end for traveling to and from Vancouver. I took the Amtrak Cascades train from Vancouver-- what a nice ride! I got back on Monday, worked at the library on Tuesday, and intended to blog yesterday. I got all the the photos uploaded and resized, etc., and then our internet access disappeared yesterday afternoon about 3:00! It turns out that an underwater cable was sliced and many of us on or near Vancouver island were without internet access for about 24 hours (it came back on just a little while ago). I did have a productive day doing chores, doing my weights, making a new bread (more about that in a later post!) and soup, and cake for yet another granddaughter's birthday, etc. The computer does take up alot of my time! I have so many things to report on and lots of pictures, so I'm going to try to blog some of it every day this week! Anyway, back to Portland! I had several reasons for visiting there-- to work with the Field Roast folks at their booth in the Culinary Expo at the IACP conference ("Portland and the new Culinary order"); to visit friends like Julie Hasson, who was my hostess, and seeing Fran Costigan, my friend the vegan Dessert Diva from New York, who was attending the conference. Julie and Fran, two beautiful Vegan Dessert Divas! I also wanted to meet Kittee, an internet foodie friend (creator and producer of the Papa Tofu zine) whom I'd never met in person and who had recently moved to Portland. As well, I wanted to see my friends Yongkie and Pokie. Kittee, Yongkie and Pokie are also friends of Julie's, and we all kind of met via my old subscription newsletter, The Vegan Feast. Julie had met another "Vegan Feaster", D., by accident. D., who is a fabulous cook and writes this blog, had attended a 5-day cooking class here on Denman Island and we all became friends. Her friends, Yongkie and Pokie, moved to Portland. D. told Julie that they were making fresh tempeh and could make it for her, so they met, too! Whew! Pokie and Yongkie at Pittock Mansion, with the Portland panorama in the background. Unfortunately for hungry vegans, this was not a very vegan-friendly event (lots of people remarked that this was strange, considering that Portland is so vegan friendly!). In fact, we found few vegan items we could eat-- some bruschetta with a green pea spread topped by asparagus was the only plainly vegan item there. We managed to ask for a few things to be served vegan-- some bean quesadillas without the cheese; crostini with onion jam and arugula, minus the meat; and some pumpernickel with beets, also minus the meat. I tell, you, we were ready to steal one of the decorative red bell peppers to munch on! Native Bowl serves several rice bowls-- layers of fresh, fragrant jasmine rice topped with grilled tofu or Soy Curls™, crunchy vegetables, killer sauces and a topping of sesame seeds, or crushed pita chips, or other crunchy stuff. Yum! Julie also makes a number of her famous vegan dessert goodies! I had lunch at Native Bowl, of course! I had the Broadway Bowl: Grilled Tofu, house-made peanut ginger sauce, fluffy jasmine rice, shredded red cabbage, carrots, scallions & cilantro. De-licious! Here's their menu. Here's their mission statement. Delicious Mock California Roll (made with Soy Curls™) and Smoky Tofu Roll. The lovely young owner very kindly made these especially for me. Here's a review and their menu. Another review. Here is my latest low-fat version of what my family calls "Mudpie Cake" (not to be confused with "Mississippi Mud Pie Cake", "Mississippi Mud Cake" or even "Dirt Cake"! ), a WWII-era cake (also called Wacky Cake, Cockeyed Cake, "Hole-In-The-Middle” Cake, or Crazy Cake) that continues to be popular today, especially with vegans, since you need no dairy or eggs to make it! 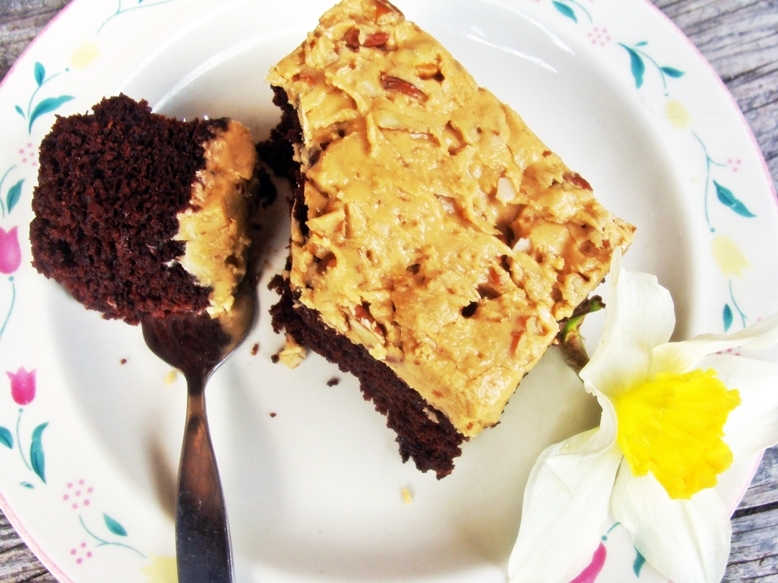 It is commonly believed that Wacky Cake may have been created as the result of rationing during World War II. Here's a quote from foodtimeline.org: "Wacky cake is an interesting study in culinary chemistry. What sets modern Wacky Cake apart from other chocolate cakes? Vinegar and method. WWI-era Dump Cakes likely provided inspiration. They do not, however, include vinegar. Depression-era Crazy cakes feature cocoa, baking soda & baking powder. No vinegar. In sum, recipes with these names vary greatly according to place and period. The connecting culinary threads are innovation, efficiency, and deliciousness." "Wacky cake is but one example of the tradition of 'make do' cakes that were popular during times of short supply. Contrary to popular opinion, eggless, milkless cakes were not invented at that time, they were revived from WWI days (which were revived from pioneer days). Dump Cake is another descendant of Wacky Cake in method. ---Encyclopedia of American Food and Drink, John F. Mariani [Lebhar-Friedman:New York] 1999 (p. 117)"
Dump Cake contained eggs, but the wartime cakes did not, since they were rationed in those times. 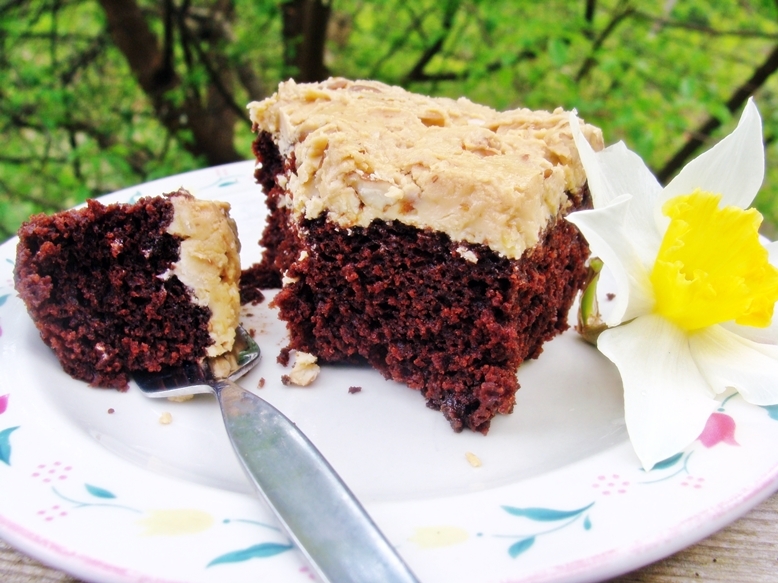 Water or leftover coffee were used instead of milk, as well, making this dark, tender cake perfect for vegans! The WWII version was called "Wacky", Cockeyed", "Hole-In-The-Middle”, or "Crazy" Cake because of the method: the dry ingredients were dumped into the baking pan and a depression was made in the middle, into which the wet ingredients were poured, and then the whole thing quickly mixed and baked. The only reference to "Mudpie" or "Mud Pie" cake I could find was to a recipe for the cake designed for children, in which the dry ingredients are shaken in a plastic bag, dumped into the pan and then mixed with the wet ingredients. I've never done that, but we've always called it "Mudpie Cake". I don't mix the ingredients in a baking pan anymore because I use less oil in the batter now than I used to, and that might cause it to stick to the pan. But it's still easy to make and you only have one bowl to rinse out! My kids loved making this cake and, especially, eating it! I have been refining my lower-fat version of this cake over the years, and also trying to use more wholegrain flour. This version contains almost half wholewheat pastry flour and substitutes applesauce for some of the oil. 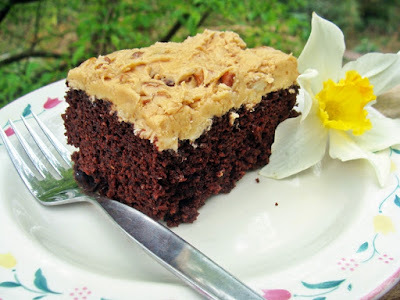 It is still easy, chocolate-y, and tender, so we often use it as a layer cake, a sheet cake (this recipe will make either one-- halve it for an 8x8" square snack cake), or for cupcakes (this recipe makes 24). I do have other chocolate cake recipes that I like, but DH likes this one the best! You can use any frosting you like on this cake, but I made it with this one for DH's granddaughter's birthday. It contains a favorite combination of ingredients. **Measure the flour after aerating it in the bag with a spoon, then sift it. Preheat the oven to 350°F. Lightly oil, or spray with oil, a 9 x 13" cake pan ; or 2/ 8" square pan s; or 2/ 9-10" round cake pans ; or 12 muffin cups (You can also use silicone muffin cup liners ). You might like to line the bottom of your pan(s) with baking parchmen t, cut to fit. Whisk the dry ingredients together well in a medium bowl. Blend the liquid ingredients in a blender until smooth, then pour into the dry ingredients and mix BRIEFLY with a whisk (important) until smooth-- do NOT beat the batter. The batter will be quite runny. Bake for the 9 X13" pan for 45 minutes; smaller pans for 25 minutes; cupcakes for about 20 minutes; or until a cake tester comes out clean. Cool on a rack thoroughly before eating (this improves flavor-- I don't think this cake is at its best when still warm). Frost the cooled cake and serve right from the pan if you like, or gently loosen and invert on a plate after cooling it off for about 20 minutes, then ice after it cools. In the large bowl of an electric mixer, cream the Earth Balance until smooth. Add 2 cups of the powdered sugar and the remaining ingredients. Beat until creamy. It may look curdled- don't worry! Add the remaining sugar, a little at a time, as you beat it, until it holds it shape well and you can see "trails" in it from the beaters. Adjust sugar or liquid (TINY drops at a time!) as needed. It will firm up when refrigerated. Stir in the nuts and coconut until well distributed. Refrigerate (covered) until it's time to frost the cake. Nutrition (per serving): 399.2 calories; 37% calories from fat; 17.4g total fat; 0.0mg cholesterol; 258.7mg sodium; 220.2mg potassium; 60.6g carbohydrates; 3.0g fiber; 43.1g sugar; 57.5g net carbs; 3.2g protein; 8.8 points. Nutrition (per serving): 220.6 calories; 26% calories from fat; 6.7g total fat; 0.0mg cholesterol; 203.5mg sodium; 176.9mg potassium; 39.8g carbohydrates; 2.1g fiber; 23.7g sugar; 37.7g net carbs; 2.5g protein; 4.6 points. Nutrition (per cupcake): 165.5 calories; 26% calories from fat; 5.0g total fat; 0.0mg cholesterol; 152.6mg sodium; 132.7mg potassium; 29.9g carbohydrates; 1.6g fiber; 17.8g sugar; 28.3g net carbs; 1.9g protein; 3.4 points. Nutrition (per cupcake): 299.4 calories; 37% calories from fat; 13.0g total fat; 0.0mg cholesterol; 194.0mg sodium; 165.2mg potassium; 45.4g carbohydrates; 2.3g fiber; 32.4g sugar; 43.2g net carbs; 2.4g protein; 6.6 points.